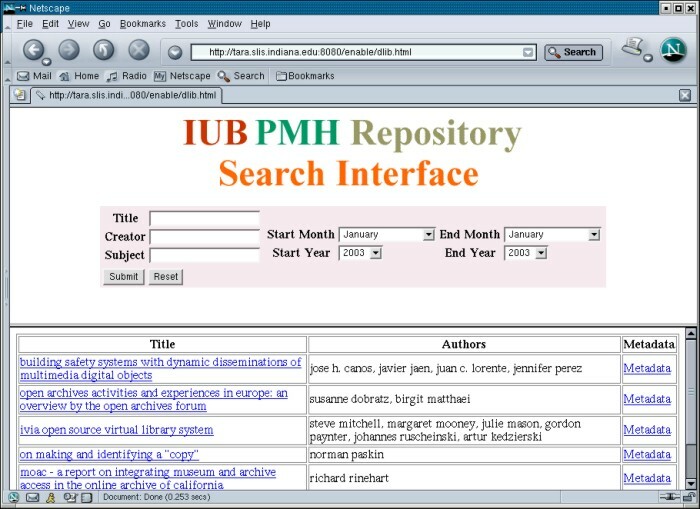 The Indiana University School of Library and Information Science opened a new research laboratory in January 2003; The Indiana University School of Library and Information Science Information Processing Laboratory [IU IP Lab]. The purpose of the new laboratory is to facilitate collaboration between scientists in the department in the areas of information retrieval (IR) and information visualization (IV) research. The lab has several areas of focus. These include grid and cluster computing, and a standard Java-based software platform to support plug and play research datasets, a selection of standard IR modules and standard IV algorithms. Future development includes software to enable researchers to contribute datasets, IR algorithms, and visualization algorithms into the standard environment. We decided early on to use OAI-PMH as a resource discovery tool because it is consistent with our mission. We are using the D-Lib Magazine archives [D-Lib Magazine] as a dataset for our prototype for several reasons. D-Lib Magazine is provided via open access for non-commercial, educational use with few restrictions (see D-Lib Magazine access terms and conditions at <http://www.dlib.org/access.html>. The content of the articles is of interest to the software developers, which is convenient when we are developing the software. Also D-Lib Magazine has a metadata file associated with each article. Each article is stored in a directory with the article HTML file, images, and a .meta.xml file that contains metadata about the article. Since March 1999, D-Lib has created an XML metadata file associated with each article published in the magazine. The metadata format is related to, but not quite the same as Dublin Core [Dublin Core] which is the metadata structure used by the Open Archives Initiative. Most of the elements map into Dublin Core [DC]. The relation field has to be selected for "URL". The creator field has to be combined for all the authors. D-Lib has a few fields that don't map into Dublin Core. This is a common problem with the limited map of Dublin Core. The Open Archives Initiative [OAI] is an open standards, open source group. They offer a number of tools, most of which are available free of charge, to help implement repositories and harvesters. We wanted a program that is easy to install, one implemented in Java, and one with which it is easy to load metadata files. The program we chose was the "Rapid Visual OAI Tool" (RVOT) from Old Dominion University [Old Dominion RVOT]. RVOT is a stand alone Java program that includes a lightweight http server. It is easy to install as a user program. RVOT includes several mapping procedures to convert metadata into the rfc1807 native metadata format [rfc1807]. Sets are supported. The program also includes an interactive user interface to map metadata fields into the native rfc 1807 format. There is some concern that the native file/directory structure might not work for large datasets, and we may need to migrate to a database repository in the future to ensure efficient performance. This rfc1807 record maps into a RVOT Dublin Core record that uses a similar syntax but substitutes rfc1807 tags for Dublin Core tags. Author maps to Creator; Organization maps to Publisher, and Copyright maps to Rights. Note that the rfc1807 fields [rfc1807] are quite similar to Dublin Core XML used in OAI-PMH. Most of the OAI-PMH fields can be directly mapped from the D-Lib meta.xml files that describe each article. The main field missing from the D-Lib metadata file is a subject terms field. D-Lib includes a <meta> tag in the <head> element of every article, using the same three keywords. Since term association is a major part of a search service we decided to use IR algorithms to compute subject (keyword) terms for each article. Most of the fields, except for the subject fields, were derived directly from the D-Lib metadata file. Extract tokens from HTML article text with Java callback parser. Drop terms that contain special characters except terms that end with punctuation (. , ? ;). Drop terms less than 4 characters in length. Drop terms in stop word list. Add term to term frequency matrix. When terms in document >100, start new document. Compute df (document frequency matrix). Drop terms that don't appear in at least 10% of documents. Compute tf/idf (Term frequency (tf) is the number of times a term occurs in a single document. Inverse document frequency (idf) is a measure of the distinctiveness of this term across the document space.) tf/idf = tf/log(N/df). Select n terms with highest tf/idf weights. Each cell of the term by document matrix is the raw frequency count of the number of times a term occurred in a particular document. The overall frequency matrix is the number of documents in which each term is found. These two arrays are used to compute tf/idf. The terms are about 25% of the tokens in the HTML document after rejecting terms with special characters, tokens less than four characters, and terms in the stop word list. The tfidf(termArray) method computes tf/idf from the raw frequency arrays. The tf/idf method provides a way for weighing terms in a document space. A term that occurs in every document is not a very useful search term and a term that appears very infrequently is also probably not that useful [Salton, McGill: 1983]. An important feature of this OAI-PMH data service is computing keywords from the text of the articles. The tf/idf algorithm requires a document space; a term by document matrix. Because paragraphs in an HTML document are difficult to define, we decided to use term proximity to define the document space. Each set of n terms (where n=100) in the current code is treated as a document. Tokens that passed the screen represented about 25% of the terms in the original document. A typical paragraph is about 400 words; hence, 100 selected terms is close to the size of a paragraph in English prose. Table 1 below illustrates the conversion data from five D-Lib articles. On Making and Identifying a "Copy"
We selected the top 20 terms based on tf/idf weight for each article. We then read the article and evaluated a simple relevance judgment for each term. The question was whether the term was relevant to the semantic meaning of the article. See Table 3 below. After running the Java program that computed subject terms, we read each article to make a judgment on whether the computed subject terms were relevant to that article. The criteria was not whether the program selected the best subject terms for that text, but rather whether the term generally reflected the semantic meaning of the article. The resulting scores varied from 70-95%. There are some terms in each article set (reach, held, likely) that would not work well at all as search terms. An interesting question for future work is whether to have a cataloger prune those terms or leave them in assuming that most users of the search interface wouldn't use those terms anyway. A harvester provides the means for collecting metadata from repositories. We wanted a harvester that would be easy to install. We also looked for one that would make it easy to schedule a harvesting job and to manage the harvested data. In addition we wanted the harvester to be open source and implemented in Java. Among the many existing OAI-PMH harvesting tools, we chose OAIHarvester from OCLC. The OAIHarvester is an open source Java application providing an OAI-PHM v.2.0 harvester framework. It provides some Java interfaces to harvest customized metadata formats. Although the OAIHarvester provides a way for harvesting the metadata, we wanted to offer users a direct view of the repository by adding some search services on top of it. The search services we developed support search functions in the fields of author, title, subject, and publication date. Users can search on any combination of the fields. The search results include the links to the retrieved article, to the authors, and to the full metadata about the article in XML format. An interesting question is whether this application produces better results than the search function already built into D-Lib Magazine. The D-Lib search service is based on a conventional full text search engine. The main difference between our search service and D-Lib's search service is that in ours the subject field contains terms generated using tf/idf. The browser and search interface can be accessed at <http://enable.slis.indiana.edu:8080/enable/dlib.html>. Search terms can be entered into the title, creator, and subject text fields. Entering terms into multiple fields is a logical OR. Start and end dates can be selected. If one simply wants to see articles from one or more issues, no terms need to be entered into the text fields. The user has to specify the date range and click on the submit button. Results are returned as a table. The user then selects the title to view the article or selects Metadata to view the Dublin Core metadata for that article. To prototype the search service, we are running the search Java servlet from a database built from data in the RVOT repository. The next step is to install an OAI harvester and run the search service from the harvester, which will harvest the metadata from the repository. This step will be completed in December 2003. OAI recommends running data services from harvested data. We will use the OCLC harvester that stores data in a database so the search servlet code will be the same. The relevance judgments described in this article were binary, and the result was expressed as a simple percent. More work is needed to improve this analysis function. There is almost no overlap between keyword sets across the several articles, which makes vector analysis difficult. A web crawler needs to be written that can discriminate between full length articles and other features in each issue. Terms were selected based on high tf/idf weights in the tf/idf matrix. Other selection algorithms need to be explored and analyzed. One selection algorithm by Mostafa is used in Sifter vocabulary generation: Select a term if it ranks in the top n terms in a document(R) and occurs in at least N documents(D) [Mostafa 1998]. We should be able to compare the resulting term vectors using statistical algorithms more sophisticated than simple percentages. The RVOT OAI-PMH repository program is quite easy to use and will easily meet our needs through the prototype stage of this project. RVOT uses a file format similar to rfc1807 to store the Dublin Core data elements. A mapping function in the server allows the user to select rfc1807 elements to map to specific Dublin Core fields. The results of computing keywords from text in the articles are quite interesting. We assigned binary relevance values to each term in the keyword list based on a fairly relaxed standard. The question we posed was not whether the keywords were the best terms to represent the meaning of the article. Our criterion was instead whether the term was a reasonable keyword for the article or a part of the article. Results varied from 70% to 95% based on that relaxed criteria. There are some nonsense terms in the keyword set but there are many terms that do reflect the semantic meaning of the article. One interesting observation is that the keyword sets for each article have little in common with other article keyword sets. That was a bit of a surprise given the tight focus of D-Lib. Another interesting feature of the relevance analysis is that most of the non relevant keywords appeared at the top of each list. The keyword list is sorted by tf/idf weight with the highest values at the top of the list. This result suggests that tf/idf weighting may not be the best method of selecting terms. The tf/idf algorithm does a good job of selecting terms for a specific document but not necessarily a good term for all paragraphs in an article. Keep in mind that we split each article into multiple documents (paragraphs) for this computation. This work was partially supported through a grant from the National Science Foundation (NSF) (Award#:0333623). [Canós 2003] José H. Canós et al. : "Building Safety Systems with Dynamic Disseminations of Multimedia Digital Objects", D-Lib Magazine, January 2003. Available at <doi:10.1045/january2003-canos>. [D-Lib Magazine] D-Lib Magazine is an electronic publication focused on digital library research and development. It is available at <http://www.dlib.org/>. [Dublin Core] Dublin Core Metadata Initiative, <http://dublincore.org/>. 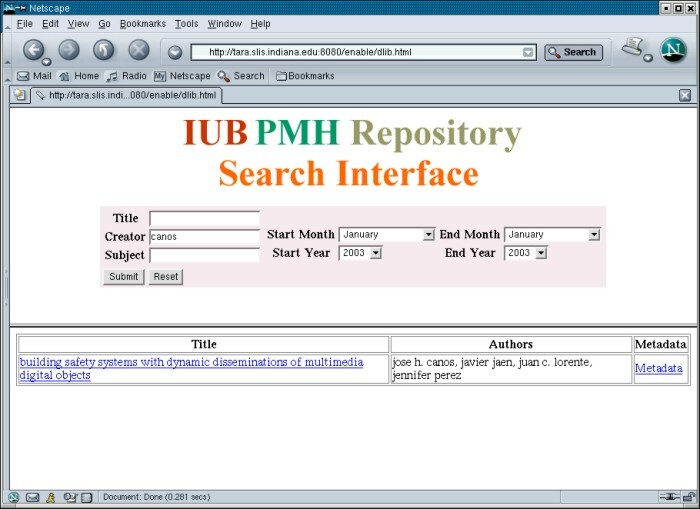 [IU IP Lab] Indiana University School of Library and Information Science Information Processing Laboratory, <http://ella.slis.indiana.edu/~lmongin/iplab/>. [Mostafa 1998] Mostafa, J., Quiroga, L., & Palakal, M. "Filtering Medical Documents Using Automated and Human Classification Methods." Journal of the American Society for Information Science, 49(14), 1304-1318, 1998. [OAI] Open Archives Initiative, < http://www.openarchives.org/>. [rfc1807] An XML Schema for the rfc1807 metadata format, 2002. Available at <http://www.openarchives.org/OAI/2.0/guidelines-rfc1807.htm>. [Old Dominion RVOT] Rapid Visual OAI Tool from Old Dominion University, <http://rvot.sourceforge.net/>. [Salton, McGill 1983] G. Salton and M. McGill. Introduction to Modern Information Retrieval. McGraw-Hill, 1983.